Fiat Chrysler CEO Sergio Marchionne, left, and Fiat Chairman John Elkann say FCA doesn't need a deal and will look opportunistically at combinations with peers that have operations outside Europe's overcrowded car market. BALOCCO, Italy (Bloomberg) -- Fiat Chrysler Automobiles CEO Sergio Marchionne sees potential to form a new No. 1 automaker as companies grapple with low returns on the growing amount of money needed to develop a new car. “There is room to create one guy which will be bigger” from the outset than current leader Toyota Motor Corp., Marchionne said in a joint interview for Bloomberg Businessweek with Chairman John Elkann at Fiat’s Balocco test track in northern Italy. “The industry needs it, as it’s still very fragmented” for the amount of capital required to develop and produce new vehicles. 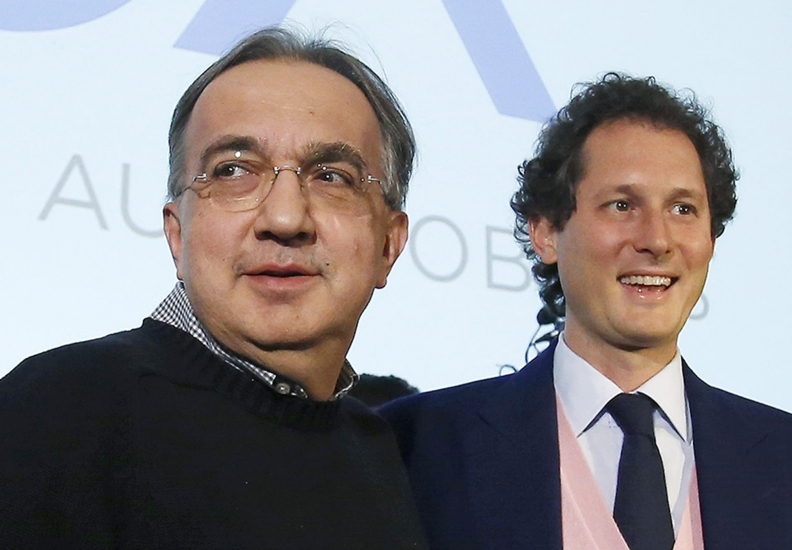 Marchionne is one of the few executives to pull off a recent merger in the auto industry. Chrysler’s former partner Daimler AG sold the U.S. automaker at a loss after culture clashes limited the extent of the savings generated from the combination. Similar issues scuttled plans by Volkswagen AG and Suzuki Motor Corp. to work together. The two have been in arbitration for years as the Japanese carmaker tries to force VW to sell a 19.9 percent stake. Willingness to combine could increase as the auto industry gets even more competitive. Regulators are requiring ever cleaner vehicles, while consumers demand more gadgetry such as voice control, in-car Internet and self-driving features. Those burdens combine with modest growth expectations. IHS Inc. forecasts that car sales will increase globally by about 3.5 percent a year on average through 2017. The level of competition, capital needs and cyclical nature of the auto industry should force more mergers and acquisitions, said Richard Hilgert, a Morningstar Inc. analyst in Chicago. “These companies strive for economies of scale to keep prices down,” he said. Fiat Chrysler Automobiles NV, the entity being created from the merger with its U.S. unit, “will be ready to participate” in the consolidation process that might take place over the next five to 10 years “if it makes sense,” said Elkann, 38, who hired Marchionne in 2004, when the Turin-based manufacturer was near bankruptcy. The two executives said the carmaker, the world’s seventh largest, doesn’t need a deal and will look opportunistically at combinations with peers that have operations outside Europe’s overcrowded car market. Neither identified likely participants in the industry’s consolidation. “It’s as important to walk away from the table as it is to sit down,” said Marchionne, 62, while smoking Muratti cigarettes and sipping espresso after accelerating his black Ferrari Enzo to more than 300 kilometers per hour (186 mph). Fiat Chrysler shares will start trading on the New York Stock Exchange on Oct. 13. The company premiered the Fiat 500X crossover at the Paris auto show last week. The model, which shares engines, transmission and other key parts with the Jeep Renegade, is an effort to show that the combination has the firepower to compete with larger global rivals like VW and General Motors Co.
“There is always talk of mergers in this industry and obviously given the research and development costs that are being faced to meet new regulations, it certainly would make sense to some degree,” said Ian Fletcher, an IHS analyst in London. Even without a deal, Fiat says it aims to climb to sixth place in the global ranking by expanding sales with vehicles such as the Renegade and a series of new Alfa Romeo models. Fiat Chrysler has said it will deliver 7 million cars in 2018, compared with last year’s 4.4 million. That was less than half Toyota’s sales. Elkann, who also runs Exor SpA -- the holding company of the Agnelli family, which founded Fiat and still owns 30 percent of the company -- plans to back the carmaker for the long term. Fiat Chrysler’s board will meet at the end of October to evaluate the company’s finances for its 48 billion euro ($60.7 billion) expansion plan. If fresh capital is needed, Elkann said he’s ready to support the carmaker’s implementation of its five-year plan, which will be Marchionne’s swan song.